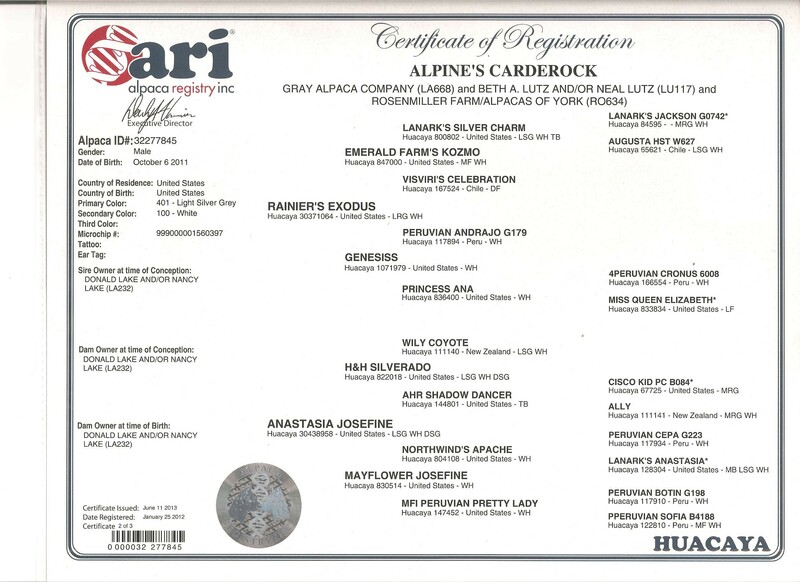 Producing top award winning crias! Here is a jewel in our herd. He is a consistent, high quality producer of silver grays and rose grays. 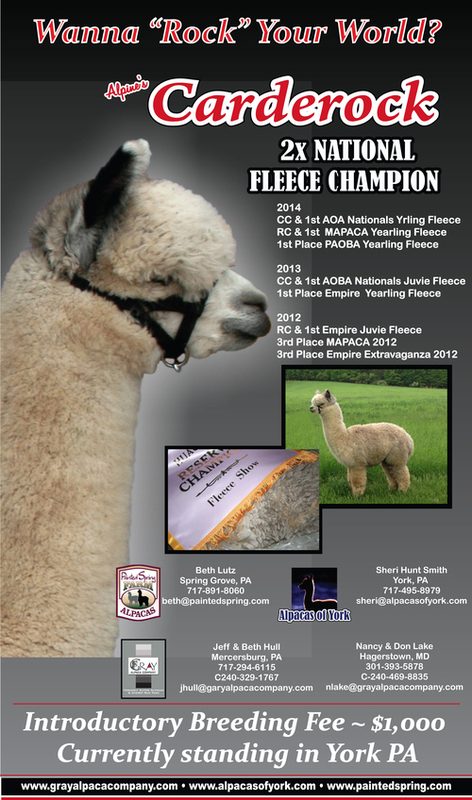 He is the sire of Alpine's Carderock, 2x AOBA Nationals Gray Fleece Champion. 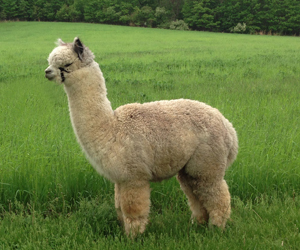 Exodus has been a successful addition to Alpine Alpacas, and now Gray Alpaca Company, and he continues to pass along his incredible density, fineness, compact structure and big bone. Dense, dense, dense! 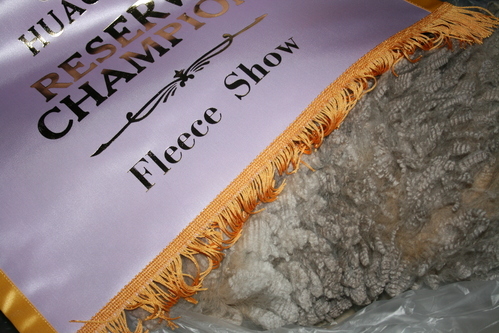 Her fleece has been entered in five of the largest fleece shows over past years, and each time she has won the Blue Ribbon, and Color Championship twice. 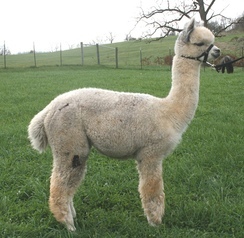 One of her crias, Carderock, is a 2x national champion. She recently delivered a stunning inky black female. Anna is one of our top foundation females, no nonsense breeder, birther, milker, and one of Jeff's favorites! 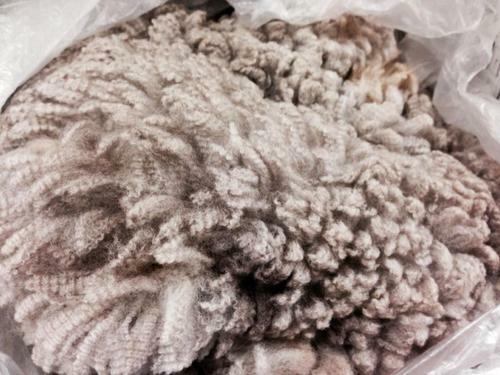 Carderock has won Fleece Championships 2 years in a row at AOBA Nationals and just this March 2014 at the AOA World Fleece Show. As a 2 year old he is still exhibiting extremely fine fleece with amazing staple length. Carderock is proving that gray is a color he can reproduce. Out of his first 8 cria, only one was not some shade of gray. Here is a link to his "baby" page. 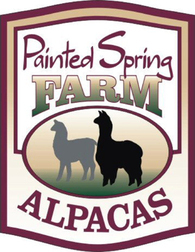 We proudly co-own Carderock with Alpacas of York. He is currently standing stud in York PA. Give us a call to see this amazing male. Carderock's Crias are hitting the ground!